• NP stand for PGA Tour Professional, Nick Price. This club was designed to his playing preferences. • This club is designed for a better player looking for playability. • Horseshoe shaped backweighting locates the center of gravity back and deep in the head encouraging higher ball flight and enhancing the club’s playability. • Mid to deep face design. • Custom, “midnight mirror blue mirror” finish. • The Driving Cavity raises the CG (center of gravity) and lowers the spin rate to create a lower more penetrating ball flight. • The Driving Cavity reduces turf drag, concentrates mass directly behind the contact point and enhances the perimeter weighting for more forgiveness on off center impact. With its corporate headquarters in Carlsbad, California, Sonartec is in the heart of Golf manufacturing country, but it is also a company that is singularly committed to specializing in woods. This intentional focus on one product has brought remarkable success to the company, demonstrating heavy adoption among Touring Professionals in a very short period of time. 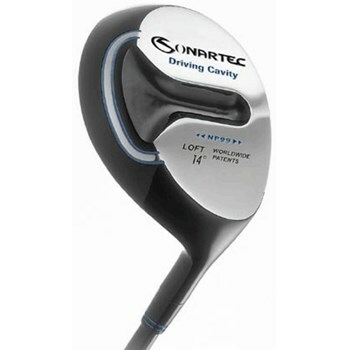 Sonartec has become the third most used fairway wood on the PGA Tour. You’ll see Sonartec in the bags of approximately 200 PGA Touring Professionals worldwide.